It’s common knowledge that ultraviolet sun rays are harmful to skin, and too much exposure will put you at a greater risk of skin cancer. This damage begins from a young age, starting with kids who fail to adequately protect their delicate skin from the sun. Kids’ skin is particularly sensitive to sun damage, and the effects are cumulative. Children love to spend time in the shining, bright outdoors. It’s critical to keep them safe while they have fun in the sun. 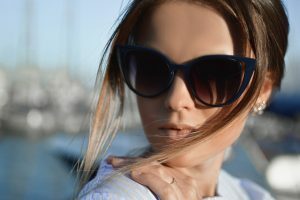 Wearing UV protective sunglasses is one eye-catching, effective way to help prevent skin cancer around the eyes and nose and to keep vision healthy. Sunburn, which indicates damaged skin cells, is the most immediate symptom caused by UV rays. Red or blistered skin should serve as a warning sign that your child is being placed at risk for worse problems – as burnt, damaged skin cells are at a much higher risk of becoming cancerous. Some of your child’s most vulnerable skin tissue surrounds the nose and eyes. Sunglasses are a voguish way to save this skin and keep it healthy, supple and soft. In addition to blocking UV rays from reaching skin, sunglasses act as a barrier over your child’s eye lens. Until about age 10, the lens is clear, which enables more solar rays to penetrate. As kids grow and their visual system develops, the lens becomes more opaque, providing enhanced natural protection. Retinal exposure to UV rays is linked to cataracts and macular degeneration later in life. When you take measures to protect your young child’s eyes, you’re setting the base for healthier vision later on. When shopping for the ideal sunwear for kids, it’s best to buy sunglasses that block 99-100% of UV rays. Another rule of thumb is that the more skin covered by the sunglasses – the more efficient the protection. Think wraparound designs for high coverage. Kids nowadays are tuned into their own fashion sense and expression. Save yourself loads of time and energy by letting them choose their own trend-setting sunglasses. They’ll look forward to showing off their new style, and soon all their friends will be sporting sunglasses too.